Unless it's a Salvaged Antique Wood Floor! Cheap grace? No, just cheap hardwood flooring. When Bethlehem Baptist Church in downtown Minneapolis demolished their sanctuary to expand, they wisely salvaged the Maple flooring for re-use. And as you can see, this new conference room was designed very sensitively with several elements from the old sanctuary. Re-using the antique wood floor was not only the most affordable option, but also the most poetic. It is either disposable. You wear it out, send it to the landfill, buy some more. This is the kind of cheap you simply can't keep. it is odd in some way. Crooked, milled backwards, perhaps, or upside down. Comes in two board lengths: short and shorter. Despite their advertising, this is the stuff you get at a liquidators. I know because I am the one who deals with the heart aches. Seriously, if Lumber Liquidators could sell it for more money, don't you think they would? So, why can't they? Because it's odd in some way and it has to be gotten rid of. I am grateful to Lumber Liquidators for giving this unusual material some place to go other than the landfill. My issue is with the mills cutting down good trees to make bad flooring. These are the businesses I'd like to see producing more do-able wood products, like tooth picks or fire starters. Come to think of it, they already make kindling...sadly. "Oh, well, we can always sell it to Lumber Liquidator. 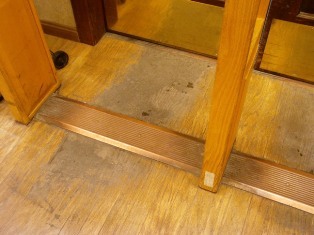 Better to eliminate the supply of bad flooring with a lack of demand for bad flooring. It used to be someone else's floor!